Micro-air vehicles (MAVs) are tiny flying machines at the mercy of even the tiniest whisper of wind. Researchers at the University of Maryland are studying how bees recover from wind gusts to see if they can't improve MAV performance. 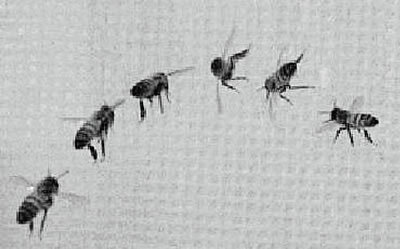 As you can see in the following video, bees use asymmetric wing strokes for quick recovery in gusts of wind. Improving MAV flight characteristics could make tight formation-flying aerostat monitors like those described in Neal Stephenson's 1995 novel The Diamond Age possible; otherwise, their dog pod grid would be difficult to achieve in breezy conditions. Also, there's nothing like studying real bees to help bring the bee cams from Karen Traviss' 2004 novel City of Pearl to life. It is described as a "non-line-of-sight munition with man-in-the loop target ID with very low collateral damage." Streaming real-time video is sent to a ground station for evaluation by troops; the entire system can be carried in two backpacks. "If you fly in the urban canyon, through alleys, around parking garages and between buildings, you need to do sharp turns, spins and dives."